This is actually the quilt back to my enlarged 28 Karats quilt… I had a girlfriend who purchased the quilt from me but she wanted it to fit her queen bed so I had to enlarge it by 10″ on all sides taking it from a double to a queen. I like to use as much of the left over fabrics from the quilts I have made. This reduces the stash and saves on having to purchase a full backing. Especially now that fabric has reached a price of $16 – $18 per meter for good quality quilt fabric here in Canada. I had a large piece of the focal fabric leftover so I decided to build round the piece I had. Because I was using left overs for the borders and I dint have enough fabric to miter my corners. If I do this quilt again mitered corners will be added. 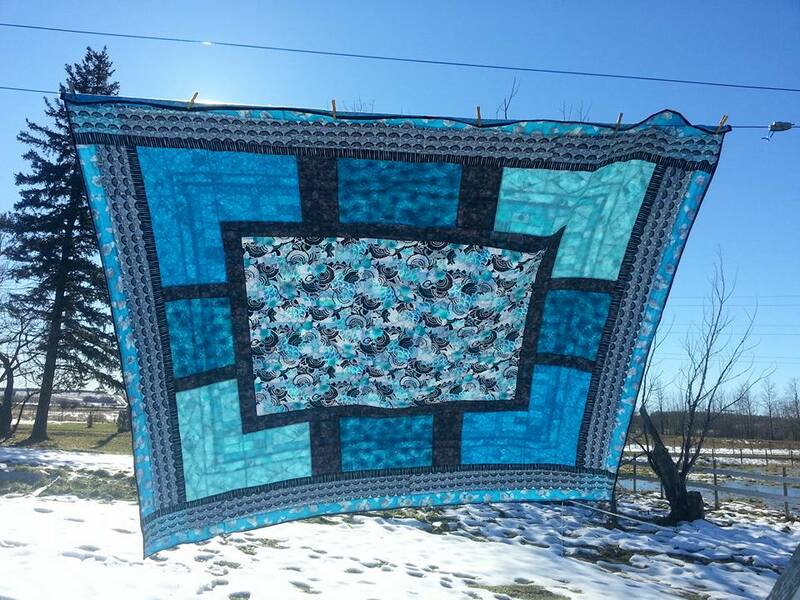 Pictures below are of the original quilt and of the enlarged one. How did I go about enlarging it? Well this was a learning curve. I sewed strips so that they would equal 10″ for the front and the back when sewn onto the quilt. The 1st side I cut the strip to the length and proceeded in adding 12 inches of batting to that side by zig zaging it on.This is where I ran into problems when I went to add the strips it was hard to line up the fabrics front and back to sew them in one seam. The next 3 sides were much easier, I sewed the border strips on first then folded them back and zig zaged the batting into place. quilted the borders and added the binding ( I was able to reuse the binding) and now the quilt was larger as my friend wanted. This is my Queen size bed and it has a good drop on all sides. I had never even thought of drafting a pattern for this one till someone on a Facebook group asked for the name of the pattern. I went ahead and drafted a pattern for it. I designed the back on my eq7 program. This is what it looked like with the program. I’ve written up a pattern for this quilt and I’m calling it Paths by the water. These are the fabric requirements. The pattern can be found at my Craftsy store as a free download for a limited time. Thanks for taking the time to read this and for downloading my pattern. Previous Top done for instructions to Christmas sew along.